Neglect was a contributing factor in the death of a woman suffering from shingles who was given the wrong drug by a pharmacy, a coroner has ruled. Eileen McAdie was given blood pressure drug Amlodipine instead of pain relief medication Amitriptyline at The Village Pharmacy in New Ash Green, Kent. The 65-year-old died 11 days later in hospital in September 2016, after falling into a coma. Family lawyer Nick Fairweather said civil proceeding would be launched. The inquest in Maidstone had heard Mrs McAdie's GP Dr Julie Taylor had prescribed an increased daily dose of Amitriptyline to treat the severe pain caused by the shingles on her face and neck, on 19 September. But Dr Taylor said pharmacist Josiah Ghartey-Reindorf told her that the wrong medication had been dispensed. Coroner Christopher Sutton-Mattocks said: "This failure is substantial, not trivial. "It is a fundamental part of the role of a pharmacist that the correct drugs are dispensed. "Her death was contributed to by neglect." Amlodipine is used to treat high blood pressure, while Amitriptyline was prescribed to manage Mrs McAdie's pain. 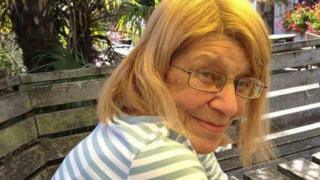 In a statement issued by the family, Mrs McAdie was described as a "much loved wife, mother, sister and grandmother". "To lose Eileen in any circumstances would have been a tragedy for the family. To have her taken from them in the way that occurred here, through these errors, is unbearable." The inquest heard Mr Ghartey-Reindorf also failed to circulate a newsletter to staff from the pharmacy owners warning about mixing up prescriptions. He has been referred to the General Pharmaceutical Council and was removed from his post in New Ash Green, demoted, and is undergoing re-training elsewhere.